As a parent, keeping your child safe from harm is likely one of your top priorities. Seeing your child happy is also important, and there's no doubt that playing with toys brings joy to your child. But toys can also be a great source of danger. It's hard to believe that a simple children's toy could cause harm, but accidents happen all the time. Many toy injuries occur to one of the most precious of all the senses, the eyes. In fact, Prevent Blindness America states that children incur approximately 11,000 toy-related eye injuries each year. These eye injuries can range from a mild corneal abrasion (scratch to the eye surface) too much more serious injuries such as a traumatic cataract, corneal ulcer, or a retinal tear or detachment. Toys are designed to be played with, but even the most innocent looking toy can cause injury to a child's eyes. The following list of toys is responsible for the most eye-related injuries in children each year. These toys don't have to be completely off limits—with a few tips, you can make them safer for your child to play with. Any toy that shoots or propels a small object can potentially cause significant damage to the eyes. Guns are the worst offenders of eye safety. You might think that giving your teenager a gun that shoots BBs or pellets is safe, but these "toys" are extremely dangerous. Toys with small firing missiles or darts are always dangerous. For some reason, kids like to hold these types of toys really close to their faces and pull the trigger. If your child must have one, always insist on they use safety goggles. Kids love action-packed movies with childhood heroes and strong characters. These types of movies ignite the imaginations of young children, introducing them to the thrills of lightsabers, wands, swords, and bows. Unfortunately, these toys sometimes have sharp edges that can possibly cause eye injuries. Playing sports accounts for many eye injuries in children every year. If your child participates in a sport, appropriate eye protection is imperative for their safety. Eye injuries commonly occur during sports such as basketball, baseball, and racquet sports. Sports-related eye injuries include blunt, penetrating, and radiation injuries. Explosive devices are best left to adults to activate. Children usually underestimate the dangers of fireworks. Even small explosions near the eye can cause devastating injuries and burns. If your child must set off fireworks, always insist on the use of protective eyewear or safety goggles. It seems like taking your kids to a public playground would be a fun, safe activity. However, a playground can be a dangerous place for kids. Always inspect all playground equipment before allowing your children to run free. Alert your children to any protruding poles or rusty chains that may go unnoticed. Also look out for overgrown bushes or trees that may contain sharp sticks. Laser pointers have recently become a cause of concern for kids. Although fun to play with, a laser can cause significant retinal damage if shown in the eyes for even short amounts of time. Supervise your child closely if one of their toys includes a laser light. Playing with toys is a very important part of child development, so try not to react to statistics and take your child's toys away. 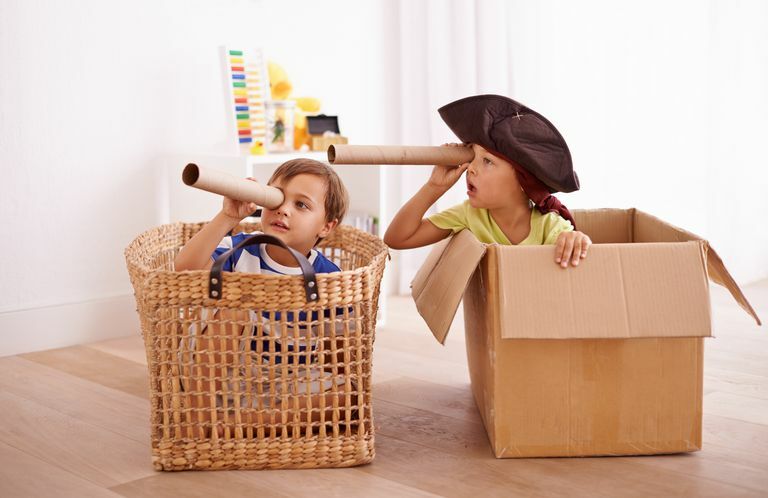 The key to ensuring the best eye safety with toys is to learn what is age-appropriate as labeled by the toymaker. A toy that is appropriate for a seven-year-old is not safe for a toddler. Prepare yourself. The internet is a good place to read safety reviews in addition to reviews of the toy itself. YouTube is a great place to watch demonstrations or safety reviews in video format. Read labels. If you see a stamp or letters that say ASTM, this means that the toy conforms to national safety standards. ASTM International, formerly known as the American Society for Testing and Materials (ASTM), is a globally recognized leader in the development and delivery of international voluntary consensus standards. ASTM indicates that the toy has been safety tested. Choose wisely. Educate yourself on the right toys for your child’s age group and research the toys that interest them. The internet is a great place to browse safety reviews and toy reviews by other parents like you. Other messages on the packaging will let you know before the purchase if it is age appropriate. Inspect. Look closely at your child's toys. Examine toys for sharp edges. Safety regulations prohibit sharp points in new toys that are designed for use in children under eight years of age. Don't be too cheap. Be careful with inexpensive toys in the budget aisle. Toys with sturdy construction are less likely to shatter or break into small, sharp pieces. Practice home safety. This sounds a little obvious but it makes sense. After purchasing a new toy, teach your child how to use or play with it safely and for its intended purpose. Teach your child to pick up toys after playtime. Dispose of broken toys immediately. Take time. Make sure your child takes the time to put on protective eyewear or safety goggles if needed. Protective eyewear is made of polycarbonate, a highly impact-resistant material. Polycarbonate lenses are available in both prescription and nonprescription lenses. If your child happens to injure his eye with a toy, you need to act quickly. Your eye doctor most likely has an emergency number for emergencies that occur after hours or on weekends. If your child's eye is visibly bleeding or the eye seems to be protruding, it's best to go directly to the hospital emergency room or urgent care facility. If a foreign object is stuck inside your child's eye, leave it alone and go straight to an emergency room. Attempting to remove the object could cause further injury. If possible, loosely tape a paper or styrofoam cup over your child's eye to protect it from further injury. Protect your children’s eyes by not buying them guns or toys not meant for their age. You can also keep your children safe by showing them how to use toys, and if necessary, by watching them when they play. If your child happens to injure his eye, seek help immediately. Most Dangerous Toys to Children's Eyes. PreventBlindness.org. Prevent Blindness America, 2010.